Tanaka string trimmers are among the best machines available. This Japanese company takes their products seriously - very seriously. The quality of these machines is is evidenced by their warranties, which are some of the best available. The “PureFire” 2 stroke engine is noted to be both powerful and friendly to the environment, with added fuel economy as an added benefit. Tanaka uses solid steel drive shafts on all their straight shaft models, unlike their competitors. Tanaka makes a plethora of models to suit both the homeowner and commercial user. Dealerships are not as prevalent as with other brands, but it may be worth your while to look hard and find these Japanese gems. The Tanaka string trimmer product line starts with Model TCG22EABSLP , a curved shaft trimmer that is powered by the smallest engine Tanaka has to offer, the 21.1cc 2 cycle. Like all Tanaka trimmers, this is the “PureFire” design, that helps lower emissions while improving fuel economy. The anti vibration design is based on a heavy duty sleeve, and should allow for a more comfortable experience when trimming the lawn. The price for this basic homeowner machine is about $110.00. The Tanaka string trimmer TCG series are lower cost units. Most feature straight shafts, which are all supported by bearings. The excellent warranty remains, but the overall design was made with price in mind. Model TCG22EASSLP is powered by the 21.1cc engine. The drive shaft is 60 inches in length, and is connected to the 4 inch semi-automatic head. The weight without head is 9.7 lbs. Count on spending $190.00 for this basic straight shaft homeowner machine. Tanaka Model TCG22EASSLPhas the larger 23.9cc engine, and is comparably equipped to it’s predecessor with a solid steel straight shaft. The cutting head is again the 4 inch semi auto. The larger engine increases the price to $270.00. Model TCG27EASPSL increases the engine size once again, to an impressive 26.9cc. The loop handle is padded, and also features the heavy duty sleeve for anti vibration. The cutting head remains 4 inch semi automatic. Weight without cutting head is 10.8 lbs. The cost is about $320.00 for this king of the homeowner machines. Want even more power at an economical price? The Tanaka Model TCG31EBSLP is powered by a 30.8cc engine, and sports a 60 inch solid steel drive shaft. The 4 inch semi automatic head comes standard, and a 3 tooth steel blade is also an option, for the real tall grass. The dry weight without head increases to 13.9 lbs. Count on spending $300.00. The version equipped with bicycle handles is known as the Model TCG27EASPSL weighs 15.4 lbs, and costs $320.00. Model TCG40EASLP represents the largest engine in the TCG line, with a 39.8cc engine. This machine is equipped with the 39.8cc engine, and is really considered a brushcutter, not just a string trimmer. The cutting head has been increased to a 5 inch semi automatic, with an optional steel blade. If equipped with a loop-style handle, the price is $410.00. If you prefer the bicycle handle, then the cost is 430.00. Now for the good stuff, so to speak. The TBC series is top of the line performance, and the prices reflect this. These are the commercial trimmers you have always dreamed of owning. Consider the TBC’s the ‘best of the best’ Tanaka has to offer. 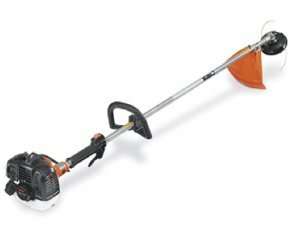 The Tanaka string trimmer Model TBC-240PFCS , is a curved shaft trimmer that is powered by the improved 23.9cc 2 cycle engine. Like all Tanaka trimmers, this is the “PureFire” design, that helps lower emissions while improving fuel economy. The anti vibration design is based on a heavy duty sleeve, and should allow for a more comfortable experience when trimming the lawn. The price for this basic homeowner machine is about $245.00. Consider the 7 year consumer warranty before saying no.....Prefer the straight shaft version of this machine? Model TBC-240PFS has a solid steel straight shaft supported by bearings, ‘no brainer’ cutting head, and the same anti vibration sleeve. The price is increased to $280.00. Next up is the Tanaka string trimmer Model TBC-255PF . This beauty is powered by the same 23.9cc engine, and has a 7mm solid steel drive shaft. The curring head has been upgraded to the 5 inch semi-automatic. The weight is 11 lbs without the cutting head, and the list price is about $340.00. A similar model is the TBC-260PF , which is equipped similarly to the TBC-255PF. Engine size and performance remains the same, with an identical drive shaft and cutting head. The front loop handle is padded for increased comfort. The cost remains about $340.00. Model TBC-280PF begins the trend for high displacement engines, with a roaring 26.9cc 2 cycle engine. The 7mm solid drive shaft is bearing supported (like all other Tanaka models), and is connected to the 5 inch semi-automatic cutting head. The larger engine increases the weight of this master of the weeds to 11.9 lbs. Okay, so maybe you are a discriminating commercial user that needs extra power, and lots of it. Being a burly individual, a little extra weight means nothing to you by the end of the day - it is all about production, baby! Perhaps the Tanaka string trimmer Model TBC-340PF would suit your needs. The engine has been increased to 32.2cc. The front handle is padded, with a 5 inch semi-automatic cutting head. The weight is 11.9 lbs, and the price is right at $390.00. Options include a bicycle handle and steel cutting blade, which when combined with a shoulder harness make this a brush cutter to contend with. As equipped with extras, the price increases to $475.00. Ask for Model TBC-340PFD . Need more power? Consider the TBC-430PF . With its 38.8 cc engine, we are talking more power than some chainsaws on the market today. The drive shaft has been upgraded to 8mm solid steel, and your choice of an automatic cutting head or a steel saw blade. Bicycle handles come standard - after all, this much power demands a good grip on things. Plan on spending $580.00 for this beast. The ultimate brush cutter from Tanaka is modelTBC-600 . Talk about power! This behemoth boasts a 46.5cc engine that produces about as much power as an East European car. The drive shaft is again 8mm, with your choice of fully automatic cutting heads or a steel saw blade. All this power means more weight - this beast weighs an impressive 19.2 lbs, so a harness is definitely recommended. The price is a modest $780.00, making this brush cutter a great stocking stuffer at Christmas! All kidding aside, Tanaka string trimmer is one great machine. The excellent engineering and durability has led to a loyal following among the fans of this brand.